The Adige river flows through and bisects Verona; bridges, therefore, have always played an essential role in the life of the city. Today there are seven that have shared the fate of being destroyed by retreating Nazis and then being reconstructed in the following years. The oldest of all is the Stone Bridge, the so called “Ponte Pietra”, made during the Roman era that still today links the Roman Theatre to the city centre. Luckily the stone blocks and bricks, thrown into the river by the explosion, were recovered and used to reconstruct the original features of the bridge. 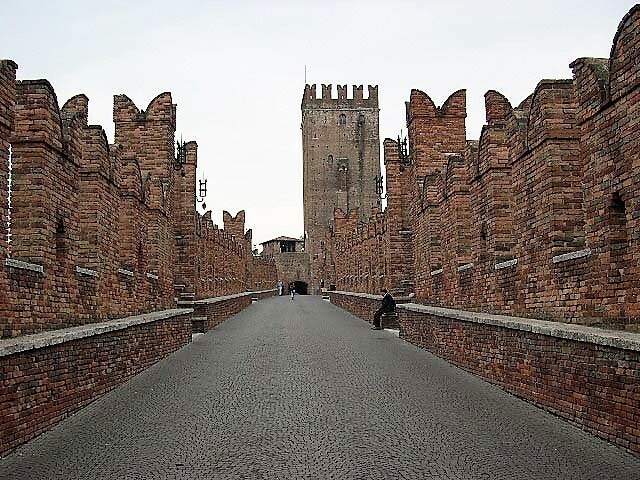 The other representative one is the Ponte Scaligero, in front of Castelvecchio. 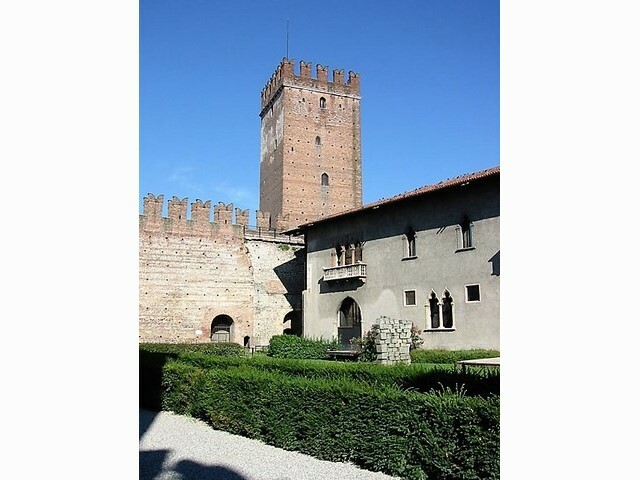 Built in the second half of the 14th century, with three unequal arches, it had the same fate of Ponte Pietra and like it was rebuilt in 1951 with stone and original bricks recovered on the bottom of the Adige. 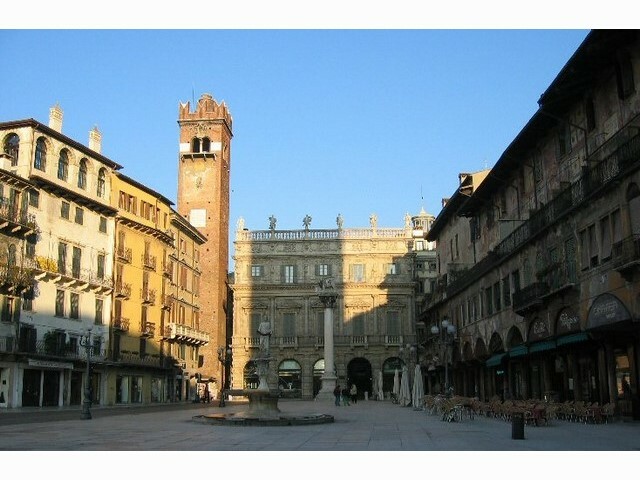 Piazza Bra is one of the largest squares in Europe, dominated by the Arena and is important because of the surrounding historical buildings. 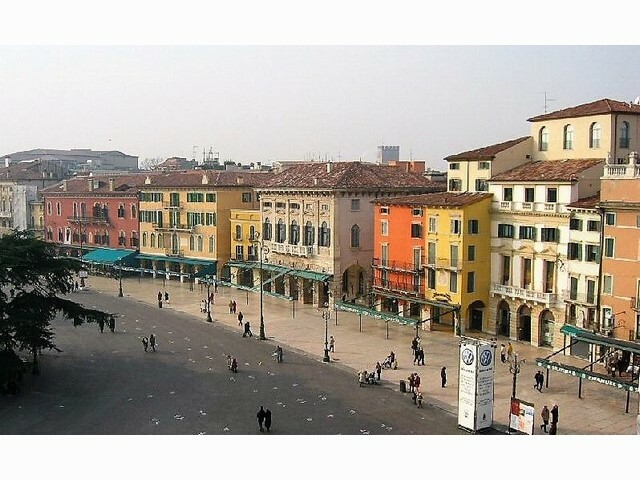 The square takes its name from the German word breit, which means wide. 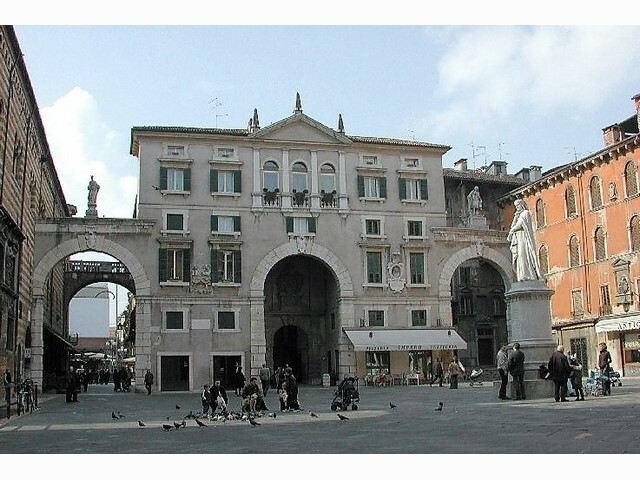 In Piazza Bra there is the liston which is a pavement made of the pink marble of Valpolicella. This is the same one used to build the Roman Amphitheatre. 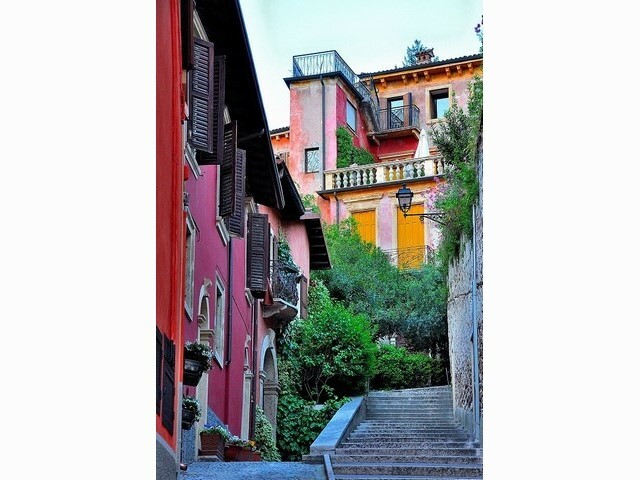 On the liston, people love to meet, walk and chat, before to sit down at a bar for a coffee or an aperitif. 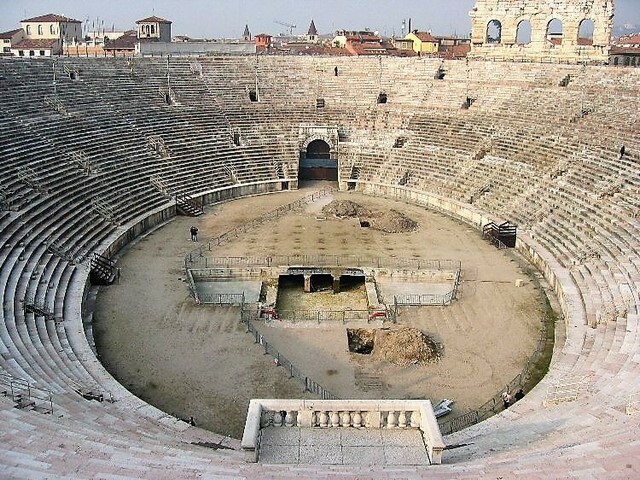 VERONA ARENA – This is the main attraction. 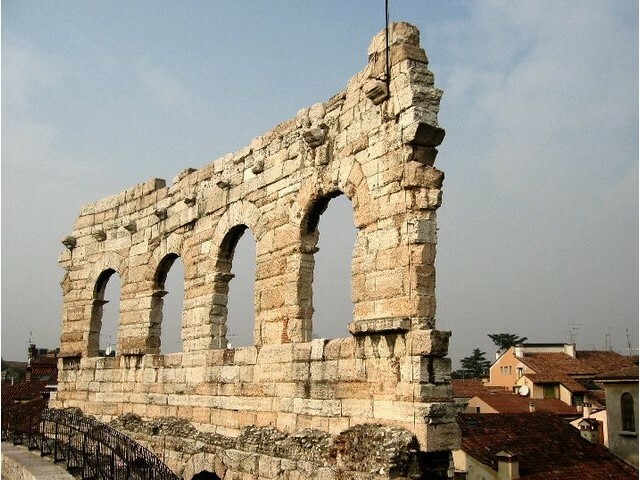 The Roman amphitheatre was built at the time of the Flavian emperors, during the 1st century AD. Only four arcades of the once magnificent façade now remain on the north side. The interior comprises an elliptical area with 45 tiers and seating for 15, 000. It has served as a fortress and even as a place where executions were held. Its age old walls were also the setting for medieval tournaments before craftsmen and vendors set themselves up in the arcades on the lower lever. OVAL; The actual arena is a hollowed-out oval at the end of the round building. This was where gladiator and bull fights, as well as animal baiting, took place. It measures almost 74m long and 45m wide. CAVEA; The spectator area, known as the cavea, is made of tiered stones, each 45cm high. Today, this area provides seating for up to 15, 000 people. The overall external length of the elliptical plan, measured from the main entrance, is nearly 140m. BASEMENT; Technical equipment now occupies the basement area of the amphitheatre. This was where there were originally rooms for the gladiators and cages for the animals. VELARIA; The spectator area can be roofed over by a complex arrangement of awnings. ALA; The outer façade of the arena was originally clad in stone. This was almost completely destroyed in an earthquake in 1183. Only one section, at the northern end, has survived and reveals the building’s original height. FAÇADE; The arches along the present façade were originally part of the building’s interior. Sadly, the reddish marble has been affected by exposure to the elements. Viewed 212 times since 7 October 2018.